This beveled glass patent plaque offers a unique blend of contemporary styling and the formal displaying of a prestigious patent award. Available in Standard Front-Page Layout and three Optional Custom Layouts (Click on photo to see available formats). 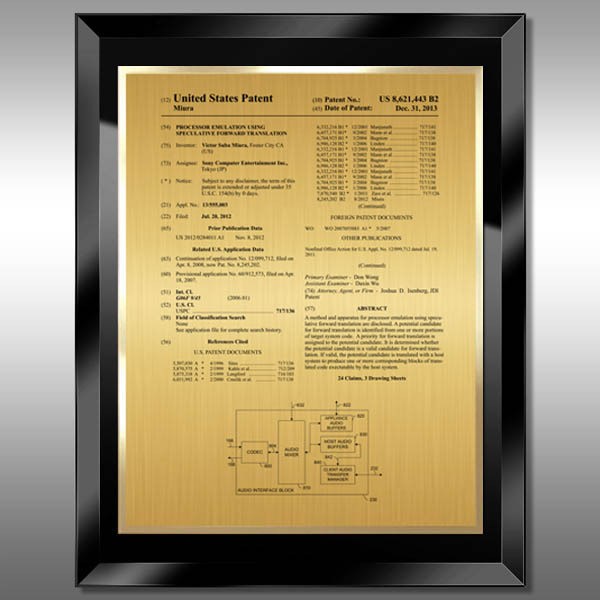 Patent information is digitally imprinted on a Gold HD Plate and is accented with a gold trim. This Black Glass Plaque is also available in our Presentation Series. Also available with our Black Metal Plates. This Patent Plaque - Glass Modern Black BG-EZG14 is part of our Modern Series of products, check out other products & options available in the Modern Series of our selection. This Patent Plaque - Glass Modern Black BG-EZG14 can be modified to your requirements and is available for your corporate award programs.